Six years straight and counting: local Rockville, Maryland dentist is building a community tradition through its continued support of the Special Olympics of Maryland Organization's 'I Walk' event. 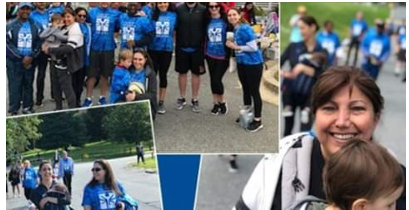 Led by Dr. Maryam Seifi, the StarBrite Dental team participated in the Inspiration Run on September 30, 2018 at Georgetown Prep School. Proceeds raised went to support the Special Olympics of Maryland (SOMO). SOMO is a grassroots organization with a mission to create a healthier and supportive community, and does that with the support of sponsors like StarBrite Dental. And Dr. Seifi takes these values back to work at her dental office, and with her entire team. StarBrite Dental provides a supportive environment for patients and employees alike, and promotes health and wellness through attention and care with each patient, every single day. StarBrite Dental is a full-service dental practice located in Rockville, Maryland, serving patients and their families within the greater North Bethesda, Potomac, Rockville, Silver Spring, and Washington DC areas. Services offered include general, emergency, and cosmetic dentistry. Additional services include: Invisalign(R), dental bridges, veneers, dental crowns, whitenings, implants, extractions, night guards, sports guards, and much more. New patients are welcome and can enjoy a New Patient Special that includes a comprehensive exam, necessary x-rays, personal consultation, and an additional $100 of their personalized treatment plan. StarBrite Dental offers convenient late night and weekend hours and is located across the street from Montrose Crossing Shopping Center on Rockville Pike. Dr. Maryam Seifi, founder and senior dentist at StarBrite Dental, received her B.S. in biology from the University of Maryland, College Park in 1986. Dr. Seifi earned her Doctorate in Dental Surgery from the University of Maryland, Baltimore in 1990. While attending school, Dr. Seifi worked as the Lead Dental Assistant at the Columbia Dental Center and the University of Maryland Dental Lab. She also served as the President of the American Women Dental Association and was a member of the University of Maryland Dental School Admissions Board. In 1991, Dr. Seifi purchased and opened her own private practice. Dr. Seifi continues her education through multiple courses, as well as won many national and local awards for her excellence in dentistry, including the Doctor’s Choice Award for Most Voted Doctor in 2016.